Pie is a grand old tradition for the holidays. 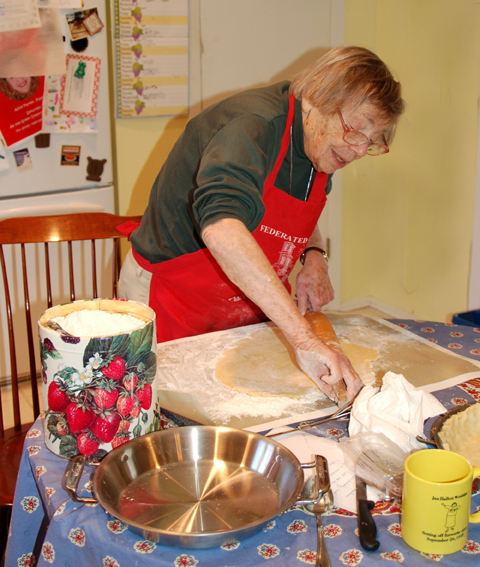 There’s love in every pie crust–particularly in our home, where my 90-year-old mother Jan is the designated crust roller. Everyone has a favorite flavor for holiday pie. As far as I’m concerned, you can keep your apples and your squash. 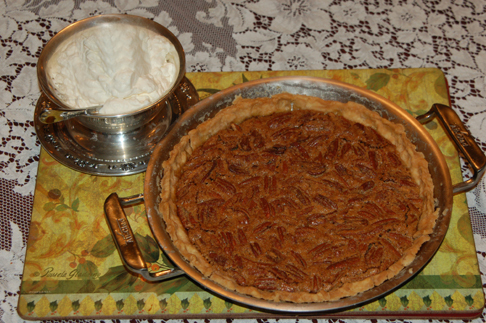 Give me a pecan pie, and I’m so happy I could sing (and frequently do)! This recipe combines two of my favorite ingredients—Southern pecans and Northern maple syrup. It comes from the recipe files of my sister-in-law’s grandmother, Lois Bullard of Memphis, Tennessee. The delicate maple flavor makes the pie taste less sweet and syrupy than many of its molasses- or corn-syrup-based brethren. Preheat the oven to 400 degrees. Cream together the butter and sugar. Beat in the eggs, flour, salt, and syrup. Stir in the pecan halves, and mix well. Pour the mixture into the pie shell. Bake for 5 minutes; then reduce the temperature to 375 degrees. Bake until the mixture just sets, 30 to 40 minutes, being careful to avoid burning. Serves 6 to 8. A little whipped cream on the side gilds this lily in decadent fashion. This entry was posted on Wednesday, December 10th, 2008 at 11:26 pm	and is filed under Cakes, Pies, and Pastry, Holiday Foods. You can follow any responses to this entry through the RSS 2.0 feed. You can leave a response, or trackback from your own site.